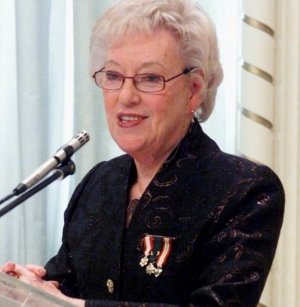 Flora MacDonald, who passed away this week, has been appropriately remembered as a female political pioneer in Canada. Less well known, however, is that she also had a ‘real love and fascination for the Middle East and all of its people’, in the words of Michel de Salaberry, a former Canadian Ambassador and someone who worked closely with her over many years. I asked Mr. de Salaberry to write a few words about Ms. MacDonald’s involvement in the Middle East, including Palestine. See his text below. “Things are becoming intense. We hear 32 structures in Susiya will be demolished.” Lenora, a Canadian Ecumenical Accompanier, responded with this searing observation late last week when I asked if I might copy and paste her letter on my blog. Please see her letter below, from 16 July 2015, in the occupied West Bank. Sincere greetings from Susiya in the South Hebron Hills. 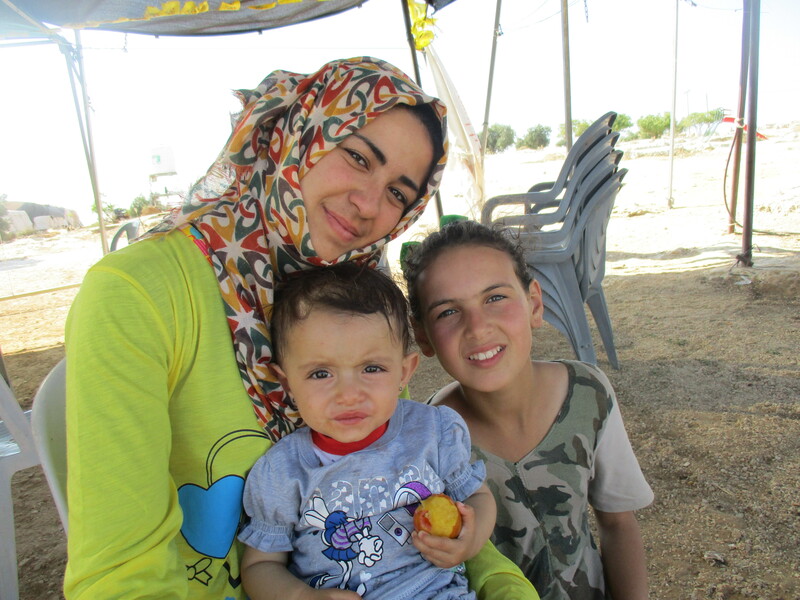 As Canadians we are delighted to invite you to come to Susiya. Dianne, Patricia, and I, Lenora, are three Canadians on the ground providing protective presence with the World Council of Churches’ Ecumenical Accompaniment Program in Palestine and Israel (EAPPI). Today, Thursday, July 16, 2015, the American Consul will arrive in Susiya. Previous embassies or consulates that have visited include the United Kingdom, Sweden and a commission of representatives from the European Union. Next week representatives from Holland, Switzerland and Norway are scheduled to arrive. The EAPPI team in Susiya consists of people from most of these nations. Canada’s representation is noticeably absent. The three Canadians are the largest contingent: all other nations have one representative. The United Church of Canada recently sent the Ramallah Consulate an update on the symbolic importance of the demolition of Susiya Village. 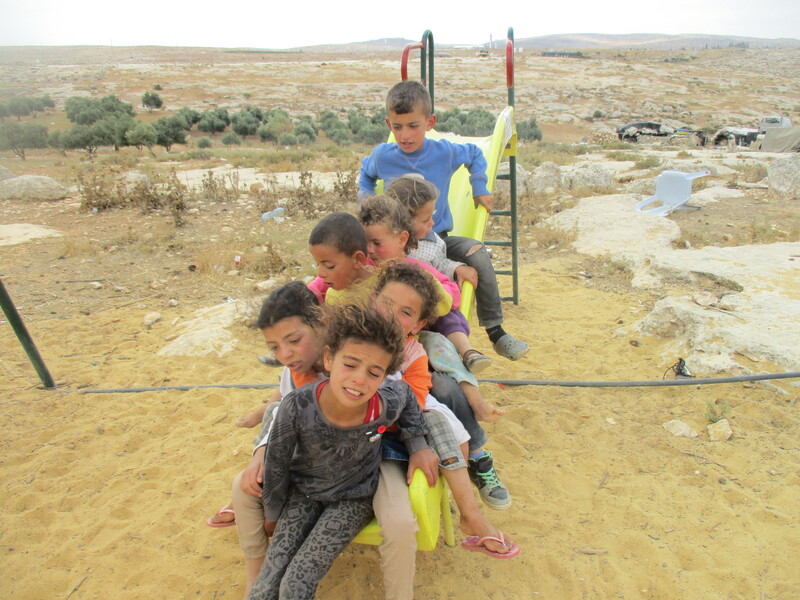 With all the international attention Susiya has gained throughout the years, the demolition and fall of this village in particular sets a precedent for all villages under demolition orders in area C [click here and here]. Rabbis for Human Rights have decided to join the EAPPI team for overnight protection in Susiya beginning July 20th until August 3rd, the period identified by CONGAT and the DCO as time when the demolition will occur. Yesterday the order came that 32 structures will be demolished following Eid ul-Fitre. As we monitor during this most difficult time, an official Canadian presence would be most appreciated. For a related posting on my blog: click here. Bulldozers Poised to Destroy Susiya! Witnessing life under occupation – Please share and talk about Patricia’s news from Susiya, a Palestinian village under threat of demolition by the Israeli government. Our worse fears are unfolding. As we were returning home this bulldozer lumbered down the road past Susiya and was delivered to the military outpost 2 minutes away! The EAPPI overnight shift arrived. Nothing to report in the handover. It had been a quiet day. Just as we arrived back in Yatta, a phone call from Nassar, the spokesperson for the village, informed us of the unwelcome but not unexpected arrival of bulldozers. We race back to Susiya. Another bulldozer, and trailer of heavy equipment and bales of hay??? have been delivered to the military outpost. The moment we have been dreading has come. We expect that the plans to demolish the village will be deployed tomorrow. 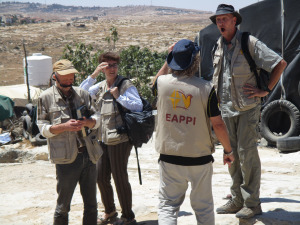 Three Canadian women are currently placed as Ecumenical Accompaniers as part of a special EAPPI team (www.eappi.org) in the occupied West Bank, particularly in the South Hebron Hills in the village of Susiya. Like many other Palestinian villages, it is under a demolition order. The Susiya village council plans to appear in the Israeli Supreme Court on August 3, 2015. 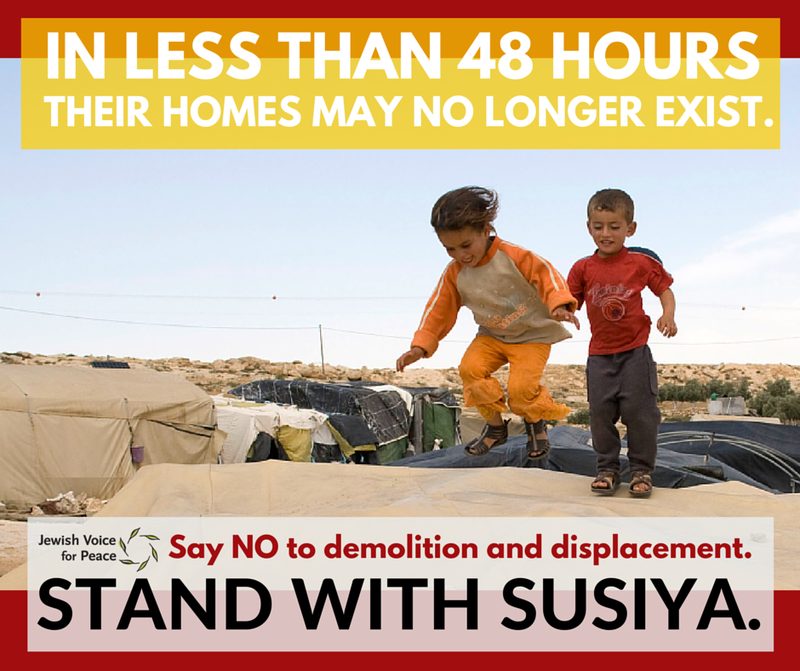 And yet, the bulldozers have already arrived in Susiya and appear ready to demolish the village before that date. No stop order for demolition was issued to prevent destruction prior to the court date. As one of the Canadian EAs reports, the UN is concerned that Canada is not stepping forward like the British government and the European Union to denounce home demolitions. Another EA offers this blog posting (below). Please write to your Canadian MP, the Prime Minister, and the Canadian Ambassador to Israel and Palestine to ask that the Israeli government not proceed with this or other Palestinian home demolitions. One village. One extended family, and a community of stunningly beautiful children. They are reserved but sophistated in a way that shows they have been exposed to the world. Nasser Nawaalja, the spokesperson for the village has been networking to save his village of Susiya, in the South Hebron Hills. As we (EAPPI) provide protective presence, we watch delegations from around the world make their way to this small farming village. Susiya has come to represent the fate of many small traditional villages in Palestine as they are under threat of demolition by the Israeli government. The children live with this reality every day. Tomorrow, or the next day, the Israeli bulldozers could demolish their homes, as they have done in the past. The UN believes, without International intervention, it will happen again.